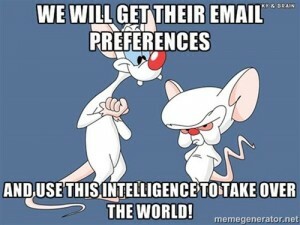 Direct Email Marketing - Good or Evil? You are here: Home / Online Marketing / Direct Email–Good or Evil? One of the most misunderstood tools in the Marketer’s Bag of Tricks is direct email. There’s good reason for it, of course. Everyone hates SPAM! I expect that even the most evil, notorious spammers of the world have SPAM filters on their personal email accounts. The end result of this universal distaste of SPAM is a belief, held by many, that sending emails to prospects or customers “just isn’t a good thing to do”. Lot’s of potential issues—from alienating your customers and potential users, to having some wacko attack and bring down your website, just because he doesn’t like a message sent to his in-box. So should we just forget about direct email as a legitimate marketing tactic and spent all of our time and money focused on other aspects of the marketing mix-such as inbound marketing? Bob’s Computer Stuff, Inc., buys “20 million email addresses for $99” from a SPAM email message sent randomly to Bob. Bob’s then fires off an email to the entire list with an offer for its extremely niche-y computer accessory, the “Swiss Army Computer Widget”. This is bad–very bad. Bob will be punished in quite a few ways and probably deserves it. Distinct Software Corp. has been methodically building a list of customers and prospects obtained using a variety of online and offline marketing methods, not the least of which is prospect visits to the company’s website. The list has been carefully compiled and in each case the client is either doing business with Distinct or has expressly given permission to receive email. Distinct has decided it would like to launch its new IT software product with a special offer to targeted prospects. The company mines it’s database for prospects that meet the targeted customer profile for the new product. It supplements it’s own list by renting an opt-in email list from a broker that was compiled from subscribers to a publication that covers issues related to the new product. Distinct then puts together a classic direct response offer (discounted price, money-back guarantee, free gift, time-limited). The company crafts a short email message describing the special offer, careful to adhere to the rules of the CAN-SPAM Act and other applicable state or international laws. The company sends the email offer out to the target list it has compiled, as one component of the marketing mix for its new product launch. This is fundamentally good email marketing practice. Do you really think that these two scenarios have anything in common? In actuality, the only thing they have in common is the delivery mechanism—email. Yet it’s very common for these two very different email marketing approaches to be lumped together in one basket. It’s all SPAM, many people will say. I beg to differ. One is terrible marketing, the other is classic marketing. BAD, scatter shot marketing is almost always poorly received, and GOOD, targeted marketing will only offend the zealots out there who are offended by ALL forms of marketing. This is true regardless of the delivery mechanism. There are people who hate traditional direct snail mail, unsolicited phone calls, advertising on TV, folks handing out flyers at the shopping mall, even print ads that take up 2/3 of their favorite magazine. There’s nothing you can do about them. The only way to please these folks is to go out of business — so don’t expend any energy worrying about them. Don’t let the crazy few stop your business from being successful. There are many reasons NOT to do direct email. One of the most important is that it’s easy to do, so it is a very crowded medium (thus “SPAM). But there’s a lot of great reasons to try it as well. One of the best “pro” arguments is its ability to add “objectivity” to the marketing process. Marketing, especially to a high tech audience, is both art and science. Marketing works best when you can tilt toward more science than art, but with new products and marketing offers it tends to be primarily art in the early stages. How are new product prices usually set, for example? Well, a few objective things are usually done, like a quick look at competitors price, but mostly somebody with decision-making power just picks a price out of the air that looks good to them. It may be a good price, it may not be, but there it is. Using this pricing example, the beauty of direct marketing is that it’s relatively easy to OBJECTIVELY test until you come up with the “right” price. Divide the list up into modules, keep all other elements of the offer static, and use a different price point for each module. If you use statistically significant samples, YOU WILL converge on the price that yields the greatest profit. That’s a rare and valuable thing to a marketer in high tech, where things change so fast and are often so squishy, that it’s sometimes hard to tell which end is up. And you can do this with ANY elements of your offer (not just price), simply by keeping everything but your test element static and using the “module” approach to test different “sizes” of that element. Of course you can do this with any direct form of marketing, but direct email adds the important attribute of being able to do your testing faster. You can test and revise, test and revise almost in real time, quickly converging on your optimal offer for the market. This is very powerful and the insight gained using direct email can then be used to optimize other marketing activities in the mix. It really helps you to switch from subjective guessing to objective decision-making in an expedited manner, which could well mean the difference between success and failure in a competitive market. If your offer is targeted at the appropriate people, it provides benefits for these targets and you deliver your message in a legal manner, you will have very few problems. An occasional nutcase will object–often strenuously–but that’s part of the cost of direct marketing as described above. The closer your offer and list come to a “one to one” message and the farther they are from from a mass market message, the fewer problems you will have. I have conducted many direct marketing campaigns over the years including quite a few direct email campaigns. Earlier in my career and prior to starting my consulting practice, I used this technique in job searches, as well as to reach out to potential customers back when I worked as an employee. Since I have started my consulting practice, I have used it with great success as well. I send email messages directly to CEOs of target companies. The messages are extremely “one to one”, tailored to the company and person I am sending it to and the target is always chosen to be a close fit with whatever I my “offer” has been at the time (A potential senior executive, a product that I knew the potential client could use, my consulting services – depending upon the purpose of my approach). So that’s it! Email is a controversial and often emotional issue for many people. I look forward to hearing what you all have to say–post a comment with your own experience and thoughts on direct email marketing. Another great article and a good reminder of the techniques of targeted marketing! We need to catch-up soon my friend :-). Thanks, Sanjiv. Good to hear from you–hope things are well.